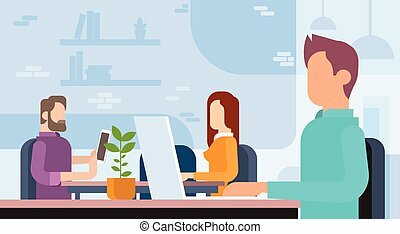 Business finance office workplace. 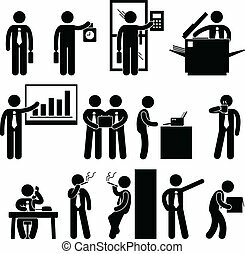 A set of pictogram showing people at work. 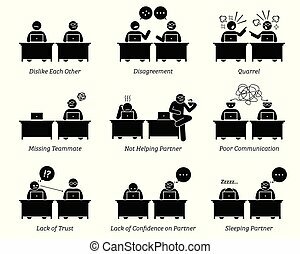 A set of business icons to represent workplace. 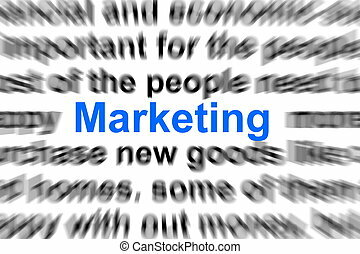 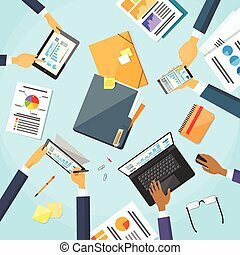 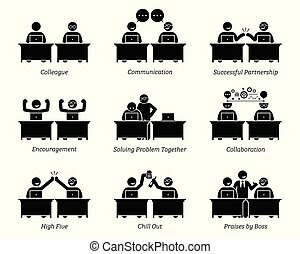 The business team has good communication, successful partnership, collaboration, problem solving, and celebration. 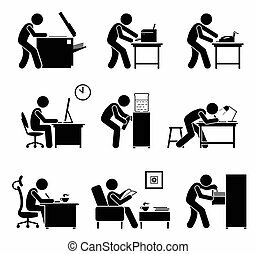 Worker making copy with photostat machine, printing with printer, receiving fax, using computer, designing, writing, and searching files inside cabinet. 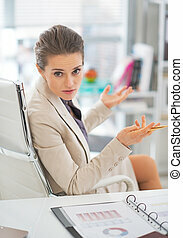 The employee is distracted, having too much work, frustrated and scolded by boss. 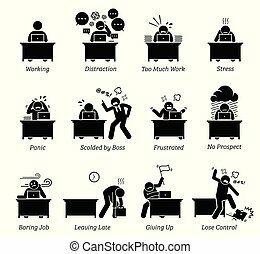 The job is boring, tiring, inefficient and has no prospect. 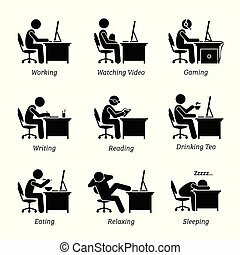 The businessman is also watching video, gaming, writing, reading, sleeping, eating, drinking coffee and relaxing while using the computer. 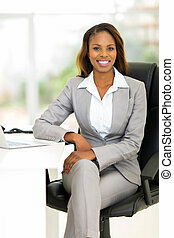 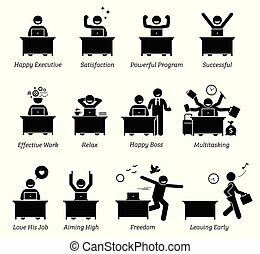 The businessman feels relax, in control, and has freedom over his job. 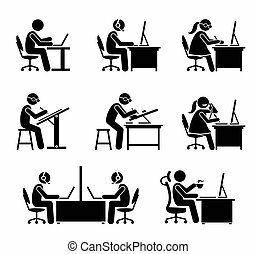 These jobs include programmer, software engineer, support, call center, customer service, secretary, helpdesk, receptionist, draftsman, and CEO. 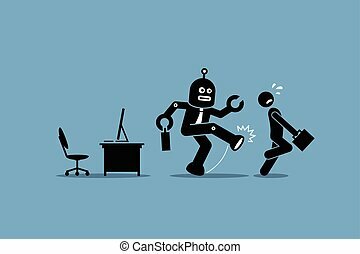 Vector artwork depicts automation, future concept, artificial intelligence, and robot replacing mankind. 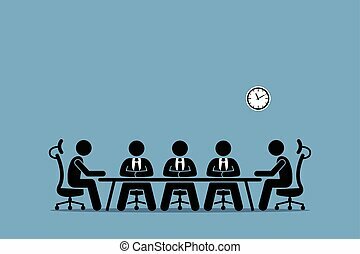 Boardroom meeting with company professional directors and shareholders. 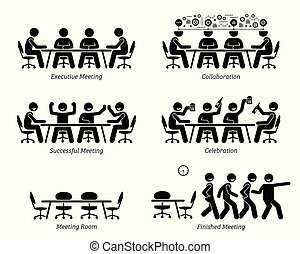 The businessmen have good collaboration, a successful meeting, and celebration. 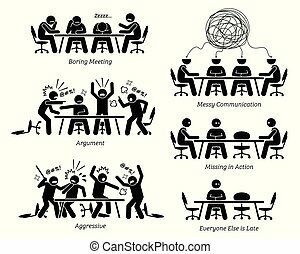 They finished the meeting earlier than expected. 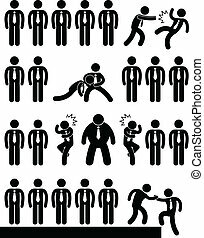 A set of pictogram representing situation in workplace or office. 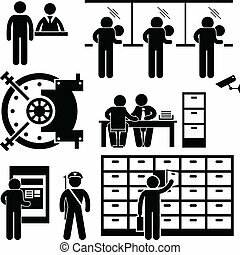 A set of pictograms representing bank employee and customers. 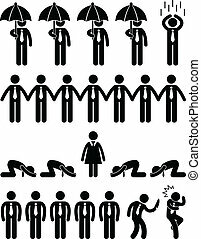 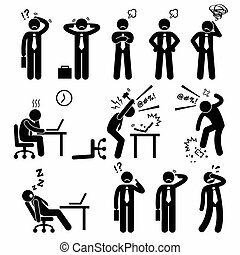 A set of human pictogram reprensenting business businessman poses and action of a stressful workplace. 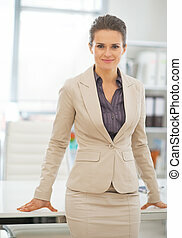 The businessman is confuse, sad, angry, and fed up with his works. 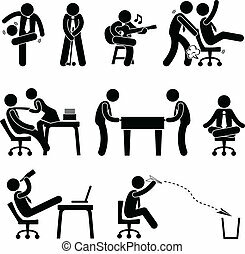 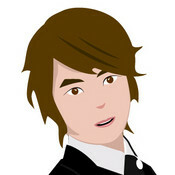 A set of pictogram representing employee having fun at workplace. 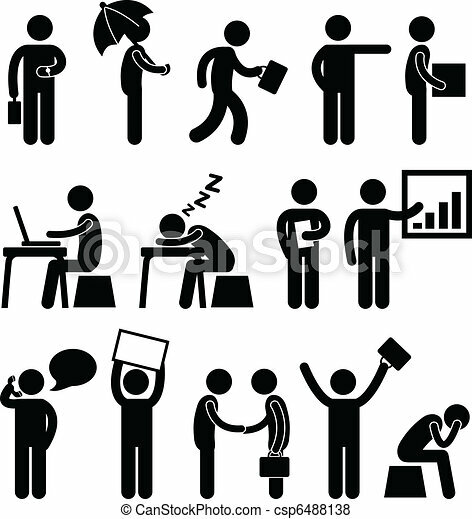 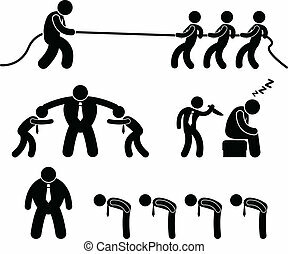 A set of pictogram showing situations of frustration situation in workplace. 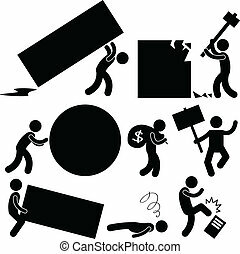 Human pictogram and icons depicting all liabilities that a company has. 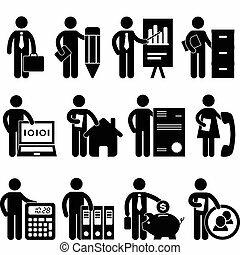 A set of pictograms showing the professions of people in the corporate industry. 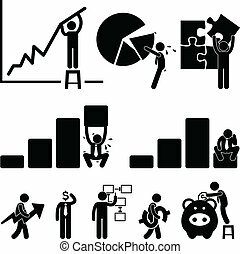 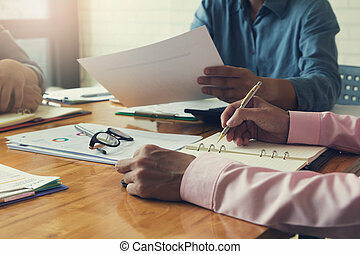 A set of pictogram representing a group of co-workers doing discussion and meeting. 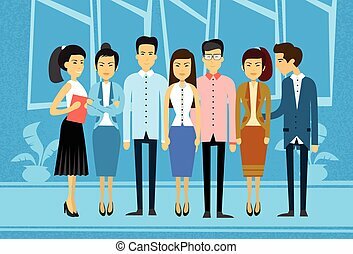 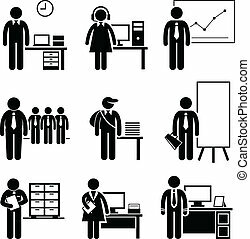 A set of human pictogram representing people looking, searching, and finding jobs and attending interviews at the office. 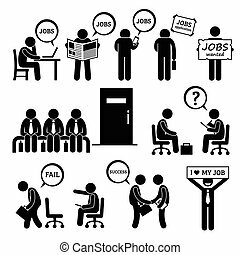 He is trying to get employment at business workplace.